Partially-bound volume of The Daily Cleveland Herald containing 156 issues from July through December 1864. This volume contains several issues with the editorial ad endorsement of Abraham Lincoln and Andrew Johnson for the nation’s top elective office. As you’d expect, the volume is crammed with all manner of war news, politics, issues of the day. 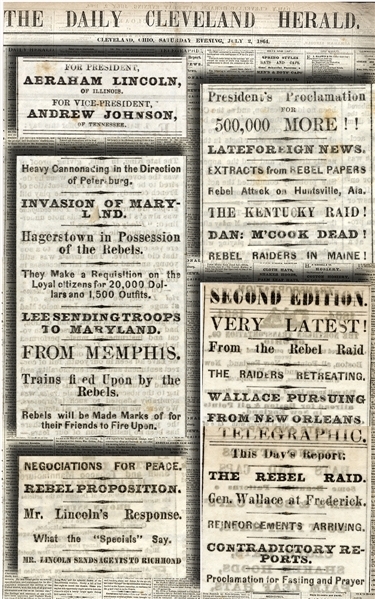 Headline highlightd will inform you: Pirate Alabama Sunk; Great Excitement at Gettysburg; Grant Demands Surrender of Petersburg; President Proclamation (to suspend writ of habeas corpus); Draft Lists; Rebel Invasion into Hagerstown; Sherman’s March to Savannah and its taking on Christmas; Lincoln Calls for 500,000 Volunteers; Gen. Halleck Reinstated; Rebel Proposition/Negotiate for Peace; Fighting at Niagara; Occupation of Atlanta; Terrific Fighting in Shenandoah Valley; Speech of James Garfield (in Senate before he was president); Farragut Bombards Mobile; Chicago Convention; Nomination of Lincoln and lists of Election Returns; Jeff Davis Flight from Richmond; Gen. Custar Promoted; Copy of Lincoln’s First Speech (1832 when he was the Whig candidate for state legislature); Capture of Plymouth; Questions of Arming The Slaves; Great Fire in New York and Burning of Barnum Museum; much more. Three issues, July 8-10 have been removed. This is a large format newspaper, though some issues are smaller, making for some ragged edges on the larger issues. Some darkstaining and archival tape repair, some tears and general wear.